After reading this, I was amazed at just how little I knew about the events preceding America’s entry into World War II. I had known there was an isolationist element at work, and that Lindbergh was the poster child for the cause. However, I didn’t realize just how strong the isolationists were, and how the United States came very close to letting Great Britain fall to the Nazis. I was also surprised by FDR’s seeming lack of leadership during this time. I suppose like a lot of people, I had been led to believe that Roosevelt was this strong, self-assured man who rallied our country when Great Britain looked to us for aid. But with his eyes on the polls, he dithered around and took only half measures until it was almost too late. The author conjectures that had not Germany declared war on the United States after the Japanese bombed Pearl Harbor, America would not have entered into the European theater at all, leaving Great Britain and the Soviet Union to fend for themselves while the U.S. went after Japan. And then there was Charles Lindbergh. The book portrays him as politically naive and devoid of emotion when it came to the debate over the war. He looked at things analytically and determined that it was not in America’s best interest to oppose Germany. Even the news of Nazi atrocities could not persuade Limbergh to give up his isolationist leanings. 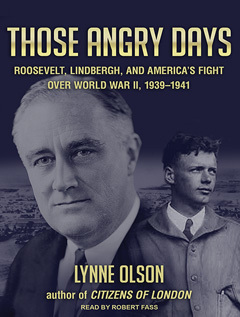 Ironically, Limbergh did enter the war in the Pacific as a pilot, unbeknownst to Roosevelt who refused to allow him to reenter the military because of his views.